Back from vacation... now on with the news. 2005 has been a big year for Fox's once cancelled show, as it came back to primetime May 1st. That episode, the first of the series' 4th season (North by North Quahog) was nominated for an Emmy for "Outstanding Animated Program (for Programs Less Than an Hour") . It's competition? Samurai Jack, The Simpsons, South Park, & SpongeBob SquarePants. 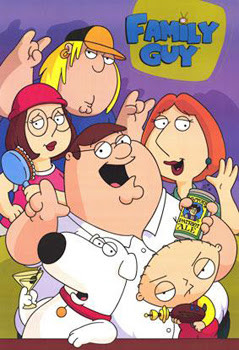 Also, Fox has officially announced the direct-to-DVD title "Family Guy Presents Stewie Griffin: The Untold Story Unrated". The DVD will be released on September 27, will retail for $29.98 US, or $41.98 CAN. The Joining Forces DVD will be on sale September 20th and comes with 3 episodes, with a runtime of 66 minutes. Price is just $14.97 SRP. When most of the Justice League is incapacitated, the League's deadliest enemies emerge to take advantage of the chaos. July 23rd is the US airdate for "Epilogue"
Fifty years in the future, the history of the Justice League is the key to Batman's darkest secret...and his final destiny. As for the next season, Rob at Comics Continuum has news from the San Diego Comic-Con on the newest plot details, including the Legion of Doom! And even more Justice League news... 2006 will see a new Justice League of America video game (the first in over 10 years on a console) for Sony's Playstation 2 & Xbox 360. In other news... the new Transformers Movie website has been up for a couple days & the movie is set to debut sometime in 2007. The new movie will be live action with a lot of CG... Marvel recently announced at the Comic-Con that they would give Microsoft exclusive rights to create a MMORPG for the Xbox 360 based on the Marvel characters.